DALI Switching – Simple projects with less than 64 DALI drivers can still be smart! 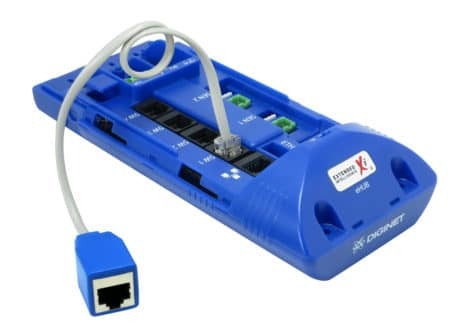 Switches are wired via a Cat5 connection to a local e-hub (cat5 patch leads are included for this purpose). The e-hub contains all the switch programming. In the event of damage to a switch, anyone can ‘clip in’ a replacement (no need for a systems integrator, or even an electrician) and the replacement switch will automatically work. Hard to beat a DALI switching system such as this, when it comes to ease of maintenance. 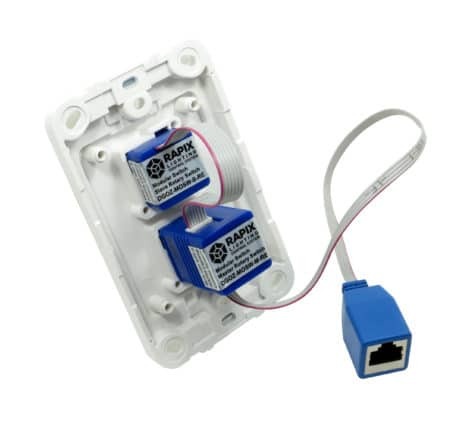 Switches are modular, and can be any configuration of rotary, rocker, or push. Another great advantage of this DALI switching system is that it doesn’t use up any of the 64 available addresses. Potentially you could have up to 96 switch plates on one DALI line! The TCP/iP port also allows third party integration e.g. to an AV system. Additionally two contacts are provided for sensors. DALI PSU + e-Hub = standalone DALI switching system. Want to know more about wiring a DALI system and the standard DALI rules? Read more . . .